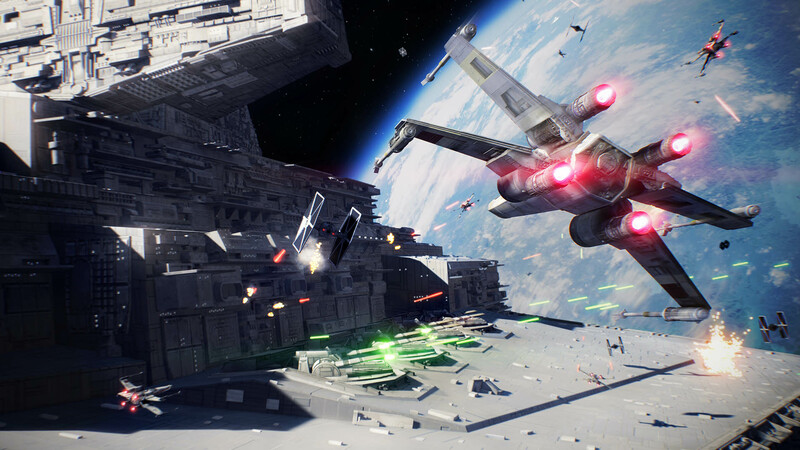 Welcome to Star Wars Battlefront II, the game that everyone loves to hate. Although the star card and loot crate systems are indeed atrocious, beneath that is still a very decent and enjoyable game. It’s safe to say that if you liked the first Battlefront game you’ll like this one too. The multiplayer has been perfected and plays more fluidly. Although there are less game modes off the bat, the game will be supported for quite some time with free additional content and more game modes and maps are to be expected. The arcade mode has made its return, but this time you luckily don’t have to beat it on the hardest difficulty settings. On top of that we got the most asked for feature this time around in the form of a single player story campaign. The graphics are spectacular and although the story is kind of bland it is a nice and worthwhile addition to the game. Although you can jump into the multiplayer right away if you like, I recommend starting with the campaign. It’s fairly short and by completing it you will unlock a few milestones which give you rewards that can be used in the multiplayer. Although not necessary for any trophies, I recommend you pick up the collectibles during your playthrough as well because they don’t cost much extra time and these too will give you rewards for the multiplayer through their milestones. I’ve added a video for the collectables under the Discoveries trophy but again, this is completely optional. There are four miscellaneous trophies that can only be obtained in the single player campaign. I recommend just playing through the campaign without worrying about these, because you can easily obtain these trophies through chapter select after you’ve completed the campaign. If you do want to do everything on your first go, please continue and read Step 2 as well. If you chose to just focus on the campaign in the first step you will get the four miscellaneous single player trophies in this one. For these trophies you’ll have to replay (part of) a few chapters. They can all be done on the easiest setting and since there’s a chapter select option they are all fairly quick to obtain. Please refer to the trophy guide below to find the (best) chapters and objectives to get these trophies. There are only two trophies tied to the Arcade Mode and they can be obtained on the easiest settings (1 star) in under an hour including loading times. From the main menu you will want to go to the “Play” tab and then choose the third option “Arcade”. There are a few options here but you’ll want to play the “Battle Scenarios”. There’s a total of 16 scenarios, in 8 of which you’ll be playing as the “Light Side” and the other 8 as the “Dark Side”. This is basically a training mode in which you practice offline against bots to prepare yourself for multiplayer. The scenarios alter between a “Team Deathmatch” and “Survival” kind of mode and you’ll have to complete all of these scenarios for the Complete Your Training trophy. The other trophy will already pop after completing your first game in Arcade Mode. This is the step where you’ll be spending most of your time towards the platinum trophy by far. The sole trophy responsible for tens of hours of extra playtime is The Force is Strong With This One. For this trophy you’ll need to reach rank 50 in multiplayer. You rank up by getting Battle Points in your multiplayer games, so however long this will take is dependent on skill. The A Galaxy at War trophy is a trophy for winning a game in each multiplayer mode. This is much easier than it sounds because every mode is team based, so even if you’re not very good at the game all it takes is being lucky enough to be on the right team in each mode at least once. Furthermore, there’s a trophy based on specific weapon use or abilities for each of the classes (Assault, Heavy, Officer and Specialist). The rest of the multiplayer trophies are game mode specific. A few of the latter ones are a huge grind and can prove more than just a bit tricky. You’ll be spending so much time in the multiplayer reaching rank 50 though that you should be able to obtain all the other trophies long before reaching rank 50, no matter your skill set. After every game and with every level up within the multiplayer mode you’ll obtain credits. These credits can be spent towards unlocking certain Heroes and Villains or they can be used for buying loot crates to obtain Star Cards and Crafting Parts. You can read more about these below, but for trophy purposes I strongly recommend not buying any loot crates with your credits until after you’ve purchased all available Heroes and Villains, for which you’ll need 65,000 credits in total. The game has two different systems for progression. First there’s a conventional levelling up system where you gain experience (Battle Points) and level up from Rank 1 to the maximum being Rank 50. Next to this there is a progression system based on Star Cards that is much more convoluted. The level here is determined on a per Class/Hero/Ship basis and the number of your rank is based on the amount of cards you have and their rarity. Star Cards can be obtained through purchasable loot crates or they can be crafted with crafting parts and they come in four different rarities, namely common (white), uncommon (green), rare (blue) and epic (purple). Your common Star Cards count for 1 level, uncommon counts for 2, rare counts for 3 and epic counts for 4 levels. At first you can only equip 1 Star Card per entity but once you reach level 5 and 10 you can use a second and a third Star Card respectively. For your Star Card level it doesn’t matter what cards you have equipped though, all the cards you have in your inventory for an entity count towards your Star Card level for that particular entity. So to reach level 5 for a specific entity, say e.g. Darth Vader, you must own either 5 common cards specific to Darth Vader, or 1 common and 1 epic card specific to him, or 1 uncommon and 1 rare card, and so on. Star Cards can have a big impact on your gameplay and can make obtaining some of the trophies easier. Most importantly though it’s a lot more fun to upgrade your characters with Star Cards cause it makes you feel much more powerful and it’s a real shame these cards aren’t just available from the start. Make sure to complete all the milestones and challenges that the game offers within your reach and note that you get a daily login crate containing at least some credits and crafting parts and sometimes a regular Star Card as well. Earn every trophy in the game to obtain this one. Congratulations! Complete the mission “The Cleaner”. Complete the mission “The Battle of Endor”. Complete the mission “The Dauntless”. Complete the mission “The Observatory”. Complete the mission “The Storm”. Complete the mission “The Outcasts”. Complete the mission “General Distress”. Complete the mission “Under Covered Skies”. Complete the mission “Cache Grab”. Complete the mission “The Battle of Jakku”. Complete the mission “Until Ashes”. Although not necessary for any trophies I recommend you pick up the collectables during your playthrough because they will give you crafting materials, which in turn will come in handy for your multiplayer endeavors. This trophy can be obtained either during your story playthrough or through chapter select after you’ve completed the story. Although there’s many places with enough enemies to do this during the campaign, the easiest opportunity to obtain this presents itself right away in the first mission called “The Cleaner”. When your objective is to reach the MC80 airlock, continue until your droid takes a while to open a door for you and you get a tutorial about how you can shoot door panels to close them. Instead of actually shooting the panel to close the door behind you, wait for a couple of seconds until a group of enemies come running down the stairs. As soon as they’re grouped up press to shock them and the trophy should pop. If you fail the above, just let the enemies kill you to get another try. Note that for the droid to have the ability to shock it needs to be fully charged, so you might have to shoot a few enemies to get it to charge again. The easiest place to obtain this trophy is in the second mission called “The Battle of Endor”. Fairly early into the mission you’ll find a bunker to your right and if you enter it you can pick up the Barrage, which is basically a grenade launcher carrying three shells. Continue down the path you’re supposed to until you get to a part with a fallen tree where there’s Troopers and Rebels fighting each other. There will be enough Rebels here for you to go for this trophy. The description of the trophy is a bit misleading and it’s actually easier to obtain than you’d think. Even though the trophy states you have to kill the enemies ‘at once’, you can use all three of your shells to kill five enemies and the trophy will still pop. If you fail nonetheless, simply restart checkpoint and try again. This trophy can only be done in the 11th chapter of the game called “The Battle of Jakku”. Immediately after the starting cutscenes you’ll find yourself in an X-Wing. To obtain this trophy you simply need to take down eight TIE Fighters. Make sure you focus only on the TIE Fighters and not the actual objectives (Beacons), because if you take down these beacons the story will progress and you will have to start over. A Scout Trooper is the sniper equivalent of the Storm Trooper. There aren’t very many of them throughout the campaign and even less that aren’t aware of your presence. The best and easiest place to do this is Mission 5 – The Storm. About halfway into the mission you will get an objective saying “Reach Kestro Defence Center”. From your spawn, stay hidden and let the group of Storm Troopers that are marching from right to left pass by. As soon as they have passed, crouchwalk straight ahead and cross the street towards a Scout Trooper that is standing with his back to you. Take him down with while still undiscovered to obtain this trophy. Note that if you do get discovered and perform a regular melee takedown it will not trigger this trophy and you will have to restart the checkpoint. From the main menu, go to the “Play” tab and choose the third option “Arcade”. There are a few options here and you can pick any of these and complete a game to obtain this trophy. For the purpose of getting all trophies, you’ll want to pick “Battle Scenarios” as the Complete Your Training trophy requires you to complete 16 of these. From the main menu, go to the “Play” tab and choose the third option “Arcade”. There are a few options here but you’ll want to play the “Battle Scenarios”. There’s a total of 16 scenarios, in 8 of which you’ll be playing as the “Light Side” and the other 8 as the “Dark Side”. This is basically a training mode where you practice offline against bots to prepare yourself for the multiplayer modes. The scenarios alter between a “Team Deathmatch” and “Survival” kind of mode and you’ll have to complete all of these scenarios for the Complete Your Training trophy. All these scenarios can be completed in under 3 minutes each so this trophy won’t be too taxing. From the main menu, go to the “Play” tab and choose the second option “Multiplayer”. In the next screen you need to pick “Galactic Assault” and win a game to obtain this trophy. In this team-based game mode there is an attacking team which has the objective to destroy, intercept or download certain targets and there’s a defending team which needs to take out the attackers. To help your team get a win try focusing on the objectives as much as possible. From the main menu, go to the “Play” tab and choose the second option “Multiplayer”. In the next screen you need to pick “Starfighter Assault” and win a game to obtain this trophy. This game mode has you flying a spaceship which you have to control and aim with the . You use the to manage your speed and change your trajectory. There is an attacking team which has the objective to destroy certain targets and a defending one which needs to take out the attackers. To help your team get a win try focusing on the objectives as much as possible. From the main menu, go to the “Play” tab and choose the second option “Multiplayer”. In the next screen you need to pick “Heroes vs. Villains” and win a game to obtain this trophy. This is a team-based ‘marked man’ mode featuring 4 heroes against 4 villains. One of the heroes and villains of each team will get marked and to score a point your team needs to kill the marked player of the other team before they kill the marked player on your team. Try playing the objective by focusing fire on the marked player of the enemy as much as possible. Even though you do get battle points for damaging and killing other ‘non-marked’ players, these battle points are just an individual thing and won’t help you secure the win in this game mode. From the main menu, go to the “Play” tab and choose the second option “Multiplayer”. In the next screen you need to pick ”Strike” and win a game to obtain this trophy. This team-based game mode is a smaller scale version of Galactic Assault with less players and a smaller map. There is an attacking team which has the objective to destroy, intercept or download certain targets and there’s a defending team which needs to take out the attackers. To help your team get a win try focusing on the objectives as much as possible. From the main menu, go to the “Play” tab and choose the second option “Multiplayer”. In the next screen you need to pick “Blast” and win a game to obtain this trophy. This game mode is a traditional form of team deathmatch. Both teams have a certain amount of lives and you need to kill all enemies with your team and have them run out of lives before your own team does. To obtain this trophy you need to get a win in all of the five available multiplayer game modes, being Galactic Assault, Starfighter Assault, Heroes vs. Villains, Strike and Blast. For a description and a short runthrough of how to play these modes, please refer to their individual win trophies, respectively: Battle Beyond the Stars, Outbound Flight, Heavy is the Hand, Strike Back and What a Blast. Self explanatory. Probably the easiest mode to obtain this trophy in is Heroes vs. Villains because this is 4 vs. 4 and thus has only few players. If you’re not comfortable playing as a Hero or Villain, then Blast will probably be your best bet. Just play aggressively and go for a kill right off the bat. This trophy is almost impossible to miss on your road to reach rank 50. This trophy is specific to the “Assault” class and can be done in any online game mode with the exception of Starfighter Assault and Heroes vs. Villains. Vanguard is the special ability of the Assault class so make sure you pick this when you’re starting your game or after you’ve died. The special ability is triggered by pressing and simultaneously and grants you a powerful shotgun that will kill in one shot if you’re close enough to your enemy. Rather than a number of shells there is a certain amount of time you can make use of the shotgun, so you’ll have to kill three enemies within this time span. To make things a bit easier on yourself you can obtain or craft a star card called “Killstreak Vanguard” to prolong the active time of the shotgun upon each kill. This trophy can be a bit tricky to get and is very situational. Try to play aggressive in objective based modes because in these modes you can find enemies grouping up at the objective points. You can check your progress towards this trophy in the main menu. Go to the “Career” tab, then choose “Troopers” and find the “Assault Vanguard Medal”. This trophy is specific to the “Officer” class and can be done in any online game mode with the exception of Starfighter Assault and Heroes vs. Villains. Boost is the special ability of the Officer class so make sure you pick this when you’re starting your game or after you’ve died. The special ability is triggered by pressing and simultaneously and grants you and the allies around you a boost in health. The description of this trophy is a bit misleading because even though you can boost a large amount of allies with a single boost as long as they’re close enough, this will still count as only 1 ally boost towards your trophy. To obtain this trophy you will have to boost at least 1 ally a 100 times, so it really doesn’t matter whether you boost 1 or 10 allies at the same time. Still this is a very easy trophy that can be done in a few games if you consistently boost an ally right when it’s available. Use the indicator in the bottom right of your screen to see if there’s an ally within your boost radius (it will state the number of allies within that radius, but again, it doesn’t matter whether this is just one or multiple allies). To make things a bit easier on yourself you can obtain or craft a star card called “Recharge Command” or “Improved Battle Command”. One of these cards makes you recharge your Boost command faster, while the other gives you a bigger radius, both of which can be very helpful. You can check your progress towards this trophy in the main menu. Go to the “Career” tab, then choose “Troopers” and find the “Field Commander” milestone. In multiplayer, defeat 150 enemies with the Heavy’s Sentry Gun. This trophy is specific to the “Heavy” class and can be done in any online game mode with the exception of Starfighter Assault and Heroes vs. Villains. The sentry gun is the special ability of the Heavy class so make sure you pick this when you’re starting your game or after you’ve died. The special ability is triggered by pressing and simultaneously and grants you a sentry gun. The gun is very powerful but takes a while to warm up before firing and it decreases your mobility a lot. The aim here is simple enough, just get a 150 kills with this special ability to obtain the trophy. Try to find choke points in objective based game modes for the most success. To make things a bit easier on yourself you can obtain or craft a star card called “Mobile Sentry” or “Supercharged Sentry”. Both of these can be very helpful depending on playstyle. You can partially check your progress towards this trophy in the main menu. Go to the “Career” tab, then choose “Troopers” and find the “Hold the Enemy Back” milestone. Unfortunately, this milestone only will state your sentry kills up until 50, but it’s a good reference as to how fast you’re progressing with this. This trophy is specific to the “Specialist” class and can be done in any online game mode with the exception of Starfighter Assault and Heroes vs. Villains. The longblaster rifles are Battlefront’s equivalent of sniper rifles. These rifles are only carried by the “Specialist” class, so you’ll have to pick this class to go for this. Even though the trophy states you need to get 25 headshots you actually need to get 25 headshot kills, which can be quite a pain cause you’ll need to land at least 2 headshots on a full health enemy to down him. Try to find a secluded area and try to get your headshots in from a distance. Objective based modes are best for this, especially if you’re on the defending side because enemies will be focused on completing objectives mostly. Unfortunately there is no way to check your progress on this trophy, so just keep popping headshots and you’ll eventually obtain this. This trophy is specific to the “Interceptor” ship class so make sure to pick that when going for this trophy. Although you can pick ships in Galactic Assault and Strike with battle points, your safest bet is to play Starfighter Assault for this trophy because you’ll be in a ship the whole game. A kill streak is when you kill multiple enemies in one live. Kill assists don’t count towards this trophy, but fortunately if you get a kill streak of more than two those kills actually will count towards the trophy. In theory you could obtain this trophy in a single kill streak of 20, but realistically it will take you a few. Note that killing AI ships counts for this trophy as well so if you’re having difficulties killing other players, go to the outlines of the map and focus on AI. To make things a bit easier on yourself you can obtain or craft star cards to e.g. upgrade your damage output, survivability or rate of fire. These can be very helpful depending on playstyle. You can check your progress towards this trophy in the main menu. Go to the “Career” tab, then choose “Starfighters” and find the “Hunt Down the Enemy” milestone. This trophy is specific to the “Bomber” ship class so make sure to pick that when going for this trophy. Although you can pick ships in Galactic Assault and Strike with battle points, your safest bet is to play Starfighter Assault for this trophy because you’ll be in a ship the whole game. The Bomber type ship has Dual Proton Torpedoes by default, which can be activated by pressing to get a lock on your enemy while they’re in your crosshairs and then again to fire them. The torpedoes alone won’t do enough damage to kill an enemy at full health, so use your primary fire to weaken them a bit first if they are. Note that killing AI ships counts for this trophy as well so if you’re having difficulties killing other players, go to the outlines of the map and focus on AI. To make things a bit easier on yourself you can obtain or craft star cards to upgrade the damage output of your torpedoes which is very helpful when going for this trophy. You can check your progress towards this trophy in the main menu. Go to the “Career” tab, then choose “Starfighters” and find the “Lock on Target” milestone. This trophy is specific to the “Fighter” ship class so make sure to pick that when going for this trophy. This trophy can only be obtained in the Starfighter Assault game mode. Probably the hardest trophy in the game, but still quite manageable once you know what to look for. Hero ships are ships you can buy during the game from the battle points you’ve acquired thus far. Depending on how well people do and on what hero ship they choose to buy they can buy one to three hero ships per game, but unfortunately since many people don’t buy them at all you won’t see that many hero ships per game. Obviously you shouldn’t buy a hero ship yourself, because you need to kill a hero ship with a fighter class ship. Now the aim is to kill 25 of these hero ships, so the first task is to find them. Some hero ships are easy to identify like the Millennium Falcon or the Slave I, but others don’t look much different from regular ships. Now the trick is to press the and keep tabs on the scoreboard. Once someone on the enemy team reaches 2,000 battle points you know there’s a possibilty they’ll buy a hero ship so from that point check the leaderboard very often. You can tell from the leaderboard what type of ship everyone is using by the icon in front of their name. If there’s an icon in front of someone’s name that looks like a star you’ll know that person is using a hero ship. Now hunt that person down and try to get the kill. Unfortunately you’ll find that a lot of people will be after him and kill assists don’t count, so you’re going to have to get the final shot in. To make things a bit easier on yourself you can obtain or craft star cards to upgrade your survivability or the damage output of your weapons. Doing more damage with your primary weapon, having a higher rate of primary fire and having a longer time until you have to cooldown are all especially helpful when going for this trophy. You can check your progress towards this trophy in the main menu. Go to the “Career” tab, then choose “Starfighters” and find the “Take out the Leader” milestone. In Starfighter Assault the attacking team has to destroy targets as their primary objective. If you manage to destroy these targets they will count towards this trophy. If you are on the defending team, every once in a while “bomber runs” will come in which are AI ships trying to attack the objective. These AI ships are marked and very easy targets and they usually come in pairs of three. Destroying these ships will count towards this trophy as well and is probably the easiest and fastest way to obtain this. You can check your progress towards this trophy in the main menu. Go to the “Career” tab, then choose “Multiplayer” and find the “Go for the Objective” milestone. Heroes vs. Villains is a team deathmatch kind of mode, except with 4 heroes who take on 4 villains. One of the heroes and one of the villains of each team will get marked and to score a point your team needs to kill the marked player of the other team before they kill the marked player on your team. This is yet another trophy with a very misleading description. You don’t just need to kill enemies while you’re the marked man, but you actually need to kill the marked man of the enemy team while you are marked as well. This is quite a tough task because everyone on your team is trying to kill the marked man on the other team, while the whole enemy team is focusing on killing you. There’s not much more you can do then getting comfortable with the playstyle of a hero/villain and play aggressively to try and get the kill on the enemy marked man. You can make this a bit easier by obtaining or crafting star cards for your favorite character. Unfortunately, there’s no way to check your progress on this trophy so you’ll just have to keep killing marked enemies until this pops. As stated in the above lists, some of the heroes and villains need to be bought for credits. You can obtain credits by completing games and milestones. If you don’t waste any credits on loot crates and focus solely on buying heroes and villains, you should be able to buy all of them before you hit rank 15. You can play as the heroes and villains in any game mode, but the Heroes vs. Villains mode is the easiest because you’ll always play as one of them as opposed to having to buy one with battle points during a game. You simply have to play as each one of them to obtain this trophy. For this trophy you simply need to get 500 kills while playing as a Hero or Villain. You can play as either in any game mode except for Starfighter Assault. The Heroes vs. Villains mode is the easiest because though because you’ll always play as a hero or villain as opposed to having to buy one with battle points during a game. You can check your progress towards this trophy in the main menu. Go to the “Career” tab, then choose “Multiplayer” and find the “Annihilation” milestone. A lot of these milestones are either very easy and come naturally or need to be completed for another trophy anyway, so you’ll obtain this trophy on your way to the platinum without having to go out of your way for it. See The Force is Strong With This One. Glitch note: It has been reported that since one of the recent updates to the game this trophy doesn’t pop upon reaching rank 25, but at rank 26 instead. This trophy is where you’ll be spending the most of your gaming time by far. To reach rank 50 you’ll need a lot of experience in the form of Battle Points. Exactly how much time you’ll spend on getting there is skill dependent, because the amount of Battle Points you manage to obtain during your games is based on your performance. You can get Battle Points for simply damaging and killing enemies but the most points can be obtained from playing the objective. No matter what mode you play, always make sure you are aware of what the objective is and go for it. Although a lot of the objectives can only be completed by one person in a game of many, you’d be surprised how few people are actually going for the objective. Most people treat every game mode as if it were team deathmatch so take advantage of that and rack up the points with objectives. There are decent points to be obtained in every game mode, but the most lucrative for now seems to be the Heroes vs. Villains mode. Glitch note: It has been reported that since one of the recent updates to the game this trophy doesn’t pop upon reaching rank 50. The trophy was still obtained by a select few people and it is believed that it pops eventually if you keep playing, but this has not been confirmed. The developer has stated they are aware of the issue but it is currently unknown if they’re working on a fix.